It’s about more than remembering—it’s about doing something. 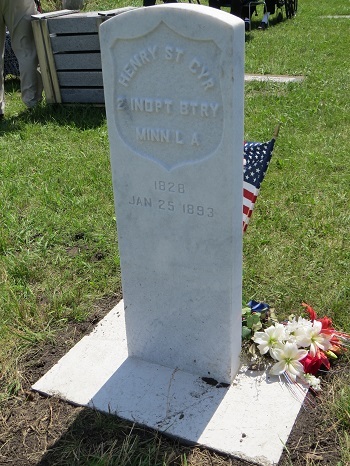 Efforts to learn more about the Battery they portray found the reenacting members of the Second Minnesota searching for the graves of the original men who fought in the unit during the Civil War. 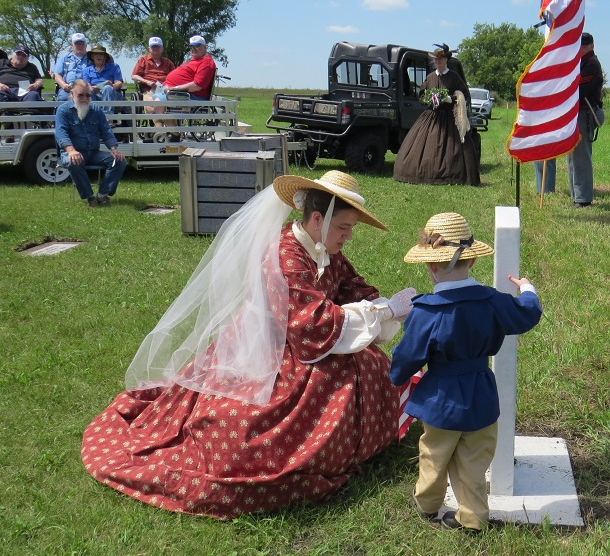 When a grave is found, the re-enactors place a flag on the grave and take a photograph. The research was a wonderful way to learn about the men and honor them, but to the great dismay of the re-enactors, not all of the graves of these veterans are marked. It was something the re-enactors—many veterans themselves—could not let go unnoticed. Knowing the Veteran’s Administration will provide a military marker free of charge to any honorably discharged veteran, the members of the reenacting Battery have taken on the mission of placing a grave marker for every Second Battery veteran they find who rests in an unmarked grave. Between 2002 and 2017, the group has placed 29 markers on graves of Battery men who had no marker. Sometimes, money is a factor and a sponsor must be found to help with the cost of setting the stone. 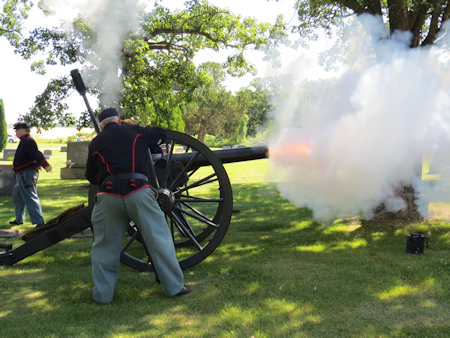 The reenacting Battery is a 501 (c) 3 non profit organization, so they often partner with a local veterans organization. The VFW or American Legion in the area of the grave is contacted and asked to help pay for the cost of setting the stone in exchange for a dedication ceremony open to the public. It has been a partnership that has benefits for both organizations and has touched the hearts of participants and guests alike. Not all graves have been dedicated with the special ceremony and firing of honor volleys by the cannon. There have been some cases where the ceremony was simply not practical and the stone was put in to remember and mark a veteran’s grave. This was the case with a stone placed on Ferdinand Lemay’s grave in Canada—taking a cannon across the border is simply not practical! As of mid-2017, there is at least one Battery veteran who still lies in unmarked graves, waiting for the proper paperwork to allow a stone to be ordered and set. It often takes a year or more to complete the process to get a gravestone set after finding the grave. Just finding the grave can be no small undertaking. Members doing the research have been looking for some graves for years and still do not know where they are. There are 19 original Battery members we cannot find at this time. But we haven’t given up. We are still looking and if they are found unmarked, if it is at all possible, their graves will be marked. At this point in the project, there is only one Battery veteran “still in the works” to get a marker. This project has often been held up for a variety of reasons—incomplete paperwork and the needed document is missing; cemetery rules or legislation about marking a grave of someone not a family member; questions about the certainty of the grave location; cost of setting the stone; etc. We are still looking for some graves. 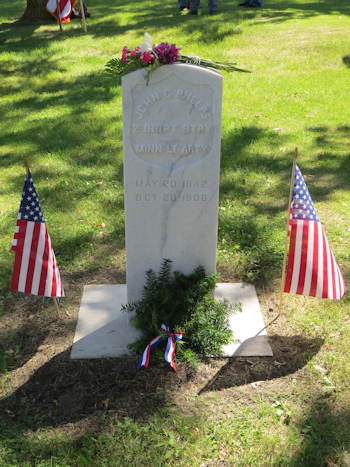 If you know of a grave of a man who served in the Second Minnesota Battery, please contact the 2nd Minnesota through this email: momwendel@hotmail.com. The following names are men for which we have not yet found final resting places. Any grave we can verify as a Second Battery member whose grave is not marked, we will work to mark if at all possible.